I blogged a bit too much the beginning of this week! Now there are a couple honorable mentions that need some posting. Wednesday I had a Dr visit. Amelia was dressed in one of her cute new outfits. We waited the customary LONG time in the waiting area. As we waited I heard a watery gurgle coming from Amelia's nether regions. She thought the noises were rather funny so giggled each time the watery sound made an appearance. She stopped laughing once a brown stream started to puddle in her cute shoes. She immediately started to dry heave and gag...me too...I rushed her out to the car smearing poo all over my pants, new shoes, and hands. I used half a pack of wipes to clean the poo off her legs, back, and arms. We went back into the office with her dressed in a diaper. Yucky, yuck. I imagine she suffered the effects of giardia from drinking lake water. The baby is doing well, has a heart beat, and moves constantly. The doctor gave me the yummy glucose test to take and scheduled me for a blood draw and rhogam shot plus an ultrasound come Monday morning. We should have an update on the baby's left brain ventricle tomorrow. I sincerely hope everything is okay. Before noon we went through 5 more diapers and three outfits. I let her go popsicle crazy to help reduce possible dehydration. I was so glad for the option to throw in her mussy clothes straight into our washer and dryer instead of dealing with bleach soaks. Her two eye teeth finally broke through so hopefully we are finished with teething until her 3 year old molars come in. That is a real milestone. Thursday we had the missionaries over for dinner. I made a yummy breakfast casserole and Miekka's cinnamon rolls. My cinnamon rolls failed miserably when compared to her confectionary delights. They looked pretty funny but tasted good. Amelia spent the afternoon at the park with Alison and the kids. Friday I went to get my glucose levels tested then took Amelia to get her hair cut. The hair dresser took a long time discussing options with me so by the time he actually started to cut Amelia's hair she was finished. Still she did much better than she did five months ago. Now she can see, no more sheepdog bangs. We met Justin at the park for a lunch picnic. 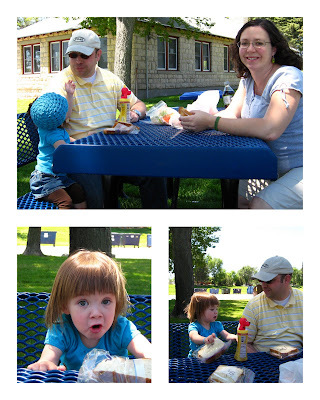 We enjoyed the nice weather and gentle breeze while eating our lunch!! Alison and Matt watched Amelia for us so we could go see Angels and Demons. We had to drive 45 minutes to Sterling to watch the movie. We got there just in time to make the 6:30 showing. It was pretty good. I actually liked the end better in the movie than in the book. I started a blanket for the baby on our drive down to the movie. Saturday morning Alison and I woke up early to catch some garage sales. I found a cool retro car Amelia can pedal around in, a booster seat, two blankets, shoes, a shower rack, and a bassinet (for $3). The bassinet was in poor condition, but cleaned up pretty good. I want to make a new cover, but after washing the bedding it seemed a daunting project. Maybe not! I will need to find some foam to make a new mattress and sew up some sheets. I remembered that time is drawing short to make up some burp clothes and blankets for the baby. I want to crochet some edgings. The flannel here is not so great so I will be doing some fabric shopping while in Utah. We watched Alison's four kids while she and Matt had a day on the town down in Denver. The time went really quick! I had the wading pool all filled up so after lunch the kids played in the pool and with the new car for over an hour. I wrenched up my courage to ask my neighbor across the street if he was willing to sell me his toy slide/fort for $10. He readily agreed! The guy even carried the monster Little Tikes play thingy over to my yard. I sort of feel like trailer trash with the huge play thing in front. We need to move it to the back. The slide is a bit steep for Amelia so I need to figure out a coushion to damper the slide crash effect. I know what would work...a YARD of grass...preferbly my own yard of grass. A gal can dream, can't she?? The boys watched Man Vs Wild while the girls napped. Then Justin grilled up some dogs for dinner. Afterwards we packed up the kids and walked to the movie theater and watched "UP" a new Disney film. The girls seemed to enjoy the animation much better than the Night at the Musuem movie. Plus we had Amelia's binky, which helped immensely! The kids were in bed by 9:30 and we crashed on the couch. Justin came over an offered to sleep on the Haley's couch until they got home...so nice! I think he wanted me to refuse the offer, but I generously accepted and had a good nights sleep at home. The Haley's partied until 1:30 am! What a nice 14 hour date for them. I woke up today with a terrible headache and a major case of the grumps. I stayed for sacrament then went home to sleep off my headache. FOUR hours later I felt much better. 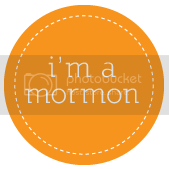 I FINALLY HAVE A CALLING IN MY WARD!!! The bishop called me to be the Gospel Doctrine teacher for the adults. I am so happy with that calling. Too bad I will be out of town for the next two to three Sundays! Took them long enough to get me a calling! Amelia had a repeat poop episode at church, complete with poop in her shoes. I used the other half of my wipie stash cleaning her up. Nasty business.